We Wanna Give You the Bird! SOURCE: Tijuana Flats Burrito Company Inc.
ORLANDO, FL--(Marketwired - January 22, 2016) - For a limited time, Tijuana Flats will offer seasoned ground turkey as a protein alternative for all items offered on the current menu to include burritos, tacos, chimichangas and more. The turkey is a healthier, lower calorie, leaner meat that will provide guests with a new, fresh choice and an alternative to the beef. Who in your life deserves to get the bird? Perhaps an ex, former or current boss, IRS, or even a pesky neighbor. 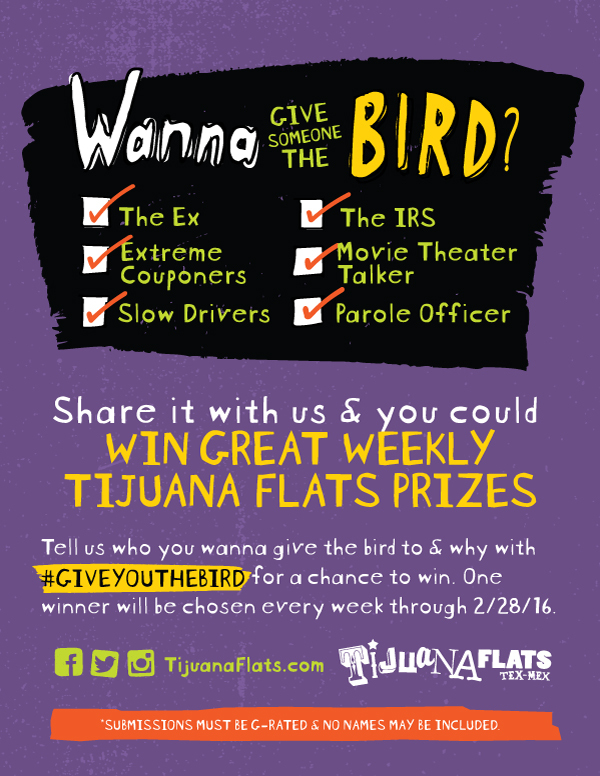 Go to Tijuana Flats' Facebook, Twitter or Instagram page and tell us who you would give the bird to and why using the hashtag #GIVEYOUTHEBIRD. Each week, we will select the best entry and give that person the bird -- turkey that is! 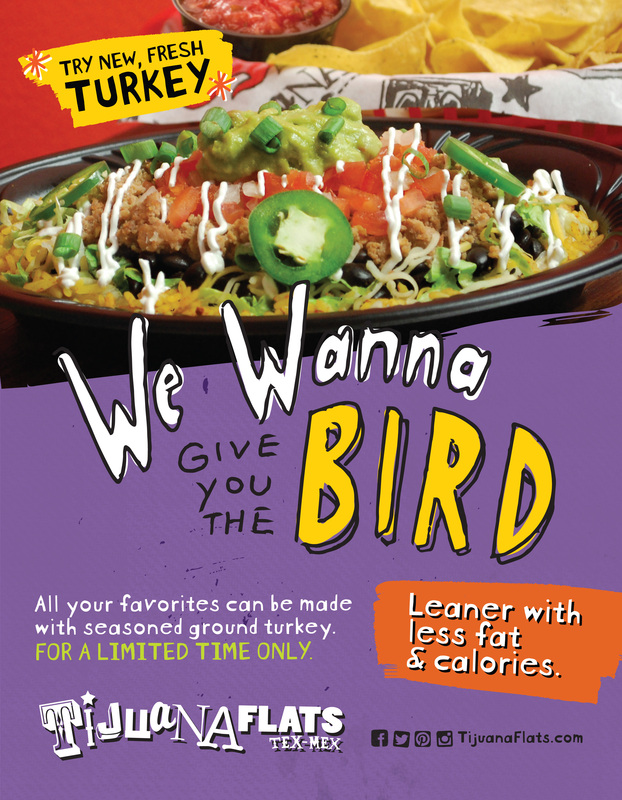 Each selected entry will win twenty five dollars in Flats Cash so you can take that certain someone to Tijuana Flats and….well, give them the bird and try the all new turkey menu. 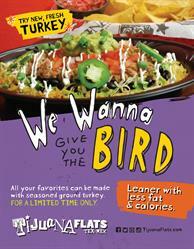 Tijuana Flats will offer ground turkey at all locations. Established in 1995 in Winter Park, Florida, Tijuana Flats is a unique, fast-casual Tex-Mex dining experience featuring superior guest service and fresh, made-to-order food. Tijuana Flats has 116 locations in Florida, Georgia, Indiana, North Carolina, South Carolina and Virginia. The brand has been named on the Fast Casual Magazine's 2015 Top 100 Movers & Shakers list. For more information on Tijuana Flats, visit www.tijuanaflats.com. 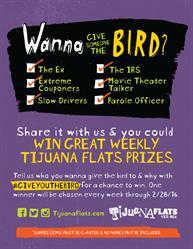 About this company Tijuana Flats Burrito Company Inc.
Wanna Give Someone the Bird?